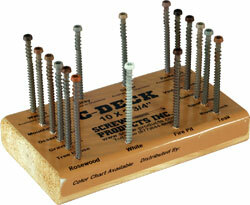 Dealer Marketing Center: Display Materials - Star Drive Wood Screws - Screw Products, Inc.Star Drive Wood Screws – Screw Products, Inc. Display Schematics (2ft + Sections) We've developed convenient preset shelf display schematics in 2ft to 20ft sets. We can also customize to your individual product needs and available space. Call us for more information at (877) 844-8880. Product Line Menu Boards For your convenience, Screw Products, Inc. has developed two Menu Boards as excellent Point Of Sales selling aids. These visual tools are specifically designed to easily sell your customers on the professional quality, application, and variety of sizes available. Both Menu Boards come with a full color Part # Reference Chart. Call us for more information at (877) 844-8880. C-Deck Composite Deck Screw Menu Board This menu board shows our C-Deck Composite Deck Screw current line for color matching purposes. Call us for more information at (877) 844-8880. 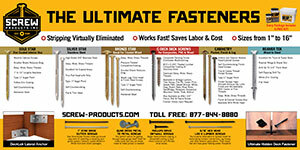 Header Cards Professional Header card features our full line of Star Drive Screws & Decking Products! This eye catching point of sales selling aid is designed to help increase product knowledge and selling ease. 1’x2’ board. 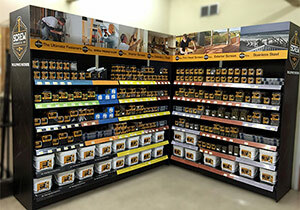 DeckLok Lateral Anchor Display We’ve developed a convenient pop up display to professionally house your DeckLok Advanced Lateral Anchors. 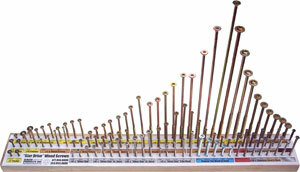 This display houses 7 boxes of 12 each DeckLok Anchors and allows ample space for product knowledge handouts.